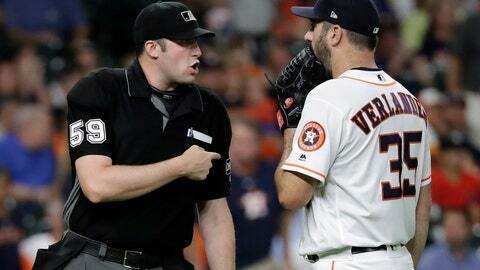 HOUSTON (AP) — Justin Verlander got pushed around by the Seattle Mariners early Thursday night, and then umpire Nic Lentz sent him off for an early shower. Certainly not what the former Cy Young and MVP Award winner had in mind for his first shot at career win No. 200. Seattle jumped on Verlander for six runs in two innings before the star right-hander was ejected for arguing a balk call in the Mariners’ 8-6 win over the Houston Astros. Mitch Haniger, Denard Span and Jean Segura combined for 10 hits and seven RBIs with a homer each off Verlander (11-7), who was ejected shortly after setting a season high for runs allowed. Haniger gave the Mariners their first leadoff homer this season when he sent a fastball into left-center field. Span followed with his second career triple off Verlander before Segura hit a ground-rule double and Nelson Cruz added an RBI single to make it 3-0. Verlander retired the next five batters before Haniger doubled with two outs in the second. He looked to have been picked off at second with Span batting, but Verlander was instead called for a balk. Verlander barked at plate umpire Lentz and kept repeating: “I did not,” before throwing his next pitch. Span and Segura then hit back-to-back homers to push the lead to 6-0. Verlander retired Cruz before getting tossed. He was still upset about it after the game and ranted about it for about three minutes when asked what happened. Verlander has been up and down in his last few starts and has allowed 10 homers and 15 runs the last five times out, including a season-high four homers in a loss to Detroit on July 15. James Paxton (10-5) continued his success against the Astros, yielding seven hits and four runs in 5 2/3 innings to improve to 4-0 against them this season. He said he didn’t feel great Thursday night so having such a huge cushion early helped. Edwin Diaz allowed a home run to Tyler White with two outs in the ninth before striking out Josh Reddick for his 43rd save. Haniger had a season-high four hits with two RBIs, Span had three RBIs and finished a double shy of the cycle and Segura added three hits and drove in two runs. The Astros cut the lead to 6-2 in the third inning when Marwin Gonzalez drove in two with a single. An RBI single by Haniger and a sacrifice fly by Span extended Seattle’s advantage to 8-2 in the sixth. Tony Kemp had three hits and drove in two runs with a single in the sixth, and White’s RBI double cut the lead to 8-5 in the seventh. The Astros were forced to use five relievers to finish the game. Roberto Osuna made his home debut for the Astros in the ninth inning, allowing one hit in a scoreless frame after being acquired in a trade with the Blue Jays last week. Osuna made his first appearance since May 6 on Monday after serving a 75-game suspension for violating MLB’s domestic violence policy. The former Blue Jays closer was arrested and charged with assaulting his girlfriend May 8 in Toronto. Astros: SS Carlos Correa said he’s feeling good and expects to come off the disabled list Friday. He hasn’t played since June 25 because of a sore lower back and just finished a five-game rehab assignment at Double-A Corpus Christi. … 2B Jose Altuve, who hasn’t played since July 25 because of soreness in his right knee, is improving, but there is still no set date for his return. Seattle reliever Alex Colome threw 1 1/3 scoreless innings on Thursday night to extend his scoreless streak to 16 2/3 innings over 16 games. Houston’s Gerrit Cole (10-4, 2.64 ERA) opposes Seattle’s Mike Leake (8-7, 4.16) when the series continues Friday night. Cole lost his second straight start Sunday when he allowed six hits and three runs in five innings of a 3-2 loss to the Dodgers. Leake is looking for his first win since June 23 after going 0-3 in his last seven starts.